The holidays are fast approaching and the time to start planning is NOW! Save yourself the headache later and get organized today. I used to be the type of person who waited till the very last minute. It caused so much unnecessary stress. I realized by starting earlier with a plan, I could enjoy this special time of year that much more. The great thing is that it’s not hard to do and you have all the tools right in front of you to get started. The key component to my holiday planning is my cell phone! 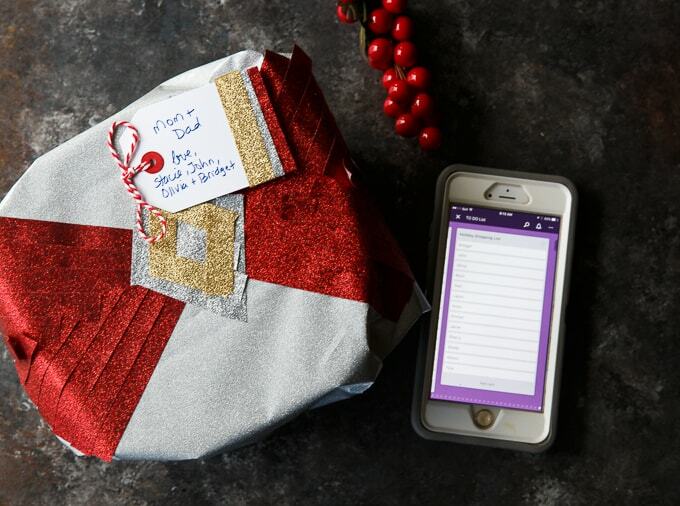 By using your phone to get ready for the holidays, you’ll save yourself time, money and stress. Everything you need to get started is in the palm of your hand….literally! 1. Make lists. I LOVE using Trello to keep my day organized and to plan my holiday shopping. And it’s free to use! Make a list of who you have to shop for and archive or delete each Trello card as you buy gifts. This way, you’ll know who is still left on your list to buy gifts for and you won’t forget anyone. I always use a list every year because I’ve unfortunately forgot someone in the past. Eek! 2. Explore Pinterest. The world is at your fingertips with Pinterest. It acts like a visual search engine where you can find recipe ideas, gift guides, holiday tips and more. Make a secret board for your holiday menu or gifts you want to buy for your friends and family. I like to keep mine Secret so friends and family checking out my account won’t know what I’m up to! 3. Create Facebook events for holiday parties. Instead of calling everyone to invite them to your upcoming holiday gathering, simply make a Facebook event and invite them all to come as guests. I’ve done numerous private Facebook events in the past and love the convenience. You can share information on the event wall about what to bring or about the event itself. You can also quickly message all the guests. People RSVP to your event so you’ll exactly the number coming and can plan accordingly. 4. Visit The Mobile Shop for holiday shopping. I mention it separately because you aren’t going to want to miss their Black Friday sales! I love The Mobile Shop because of their fantastic selection of phones and plans plus you can’t beat the convenience of their location. They are found in grocery stores where President’s Choice products are sold. You can pick up your groceries and do a little holiday shopping. They have all the deals you want with none of the craziness! I’m buying my daughter, Bridget, a cell phone for Christmas…shhhhh. 5. Use a calendar app to keep track of engagements. There are a ton of calendar apps out there and it really doesn’t matter what one you use as long as you actually USE it. My calendar app keeps me on track for both work and family. I can quickly see what’s coming up so I never forget an appointment or party! 6. Browse flyer apps to find sales. I like using the Flipp app to quickly see what’s on sale that week at my local stores. They are great to use if you price match and want to save a little bit of money. I check out the app weekly so I can see if there’s any upcoming sales on items that would make great holiday gifts! Heads up! The Mobile Shop has a fantastic promotion for Black Friday you won’t want to miss. They are offering up to 300,000 PC points on phones – you can redeem those points for free food! How do you use your phone for holiday planning? These are great tips! Thanks! I definitely use the calendar on my phone and also the reminders and notes sections! Alarms and timers are helpful as well! Some really good tips here, and because we have our phones with us most of the time, it makes so much sense. These are great ideas. Smart phones aren’t called “smart” for nothing! We need to use them! I have a shopping app and a few savings apps to help me with holiday shopping. i also have my lists int he cloud, so I can use my phone for lists instead of dragging along paper. It seems like I use my phone more and more for all kinds of things! It’s a great tool for planning, esp. for the holidays! This sounds like such a great idea. I have got to try it myself! I use my phone for a ton of things. It is perfect for setting reminders to remind me to get things done during the day. I will have to try these tips. I’m afraid that I’m still a paper and pen type of person. I do have a few notes on my phone but apart from the alarm clock there’s not much else on my phone that I use – I might add that I have zero data. I can get overwhelmed if I’m not scheduling and checking things off. Using my calendar that I can access on both my computer and my phone is the best. I started to use Trello and then I kind of stopped. I need to get back on it stay on top of all my stuff to-do! I can’t live without my calendar app. I can’t live without my lists I have on my phone either! Love these tips! I use my phone for a lot of our holiday planning. I have our shopping list, what I’ve bought and I even snap pics of receipts. These are really awesome tips! I will definitely try this for our holiday plans! I don’t utilize my phone enough. I usually use pen and paper to make lists. I will have to try using my phone. A good phone makes life so convenient … and I love having all the lists and things in one spot. These are really great tips. 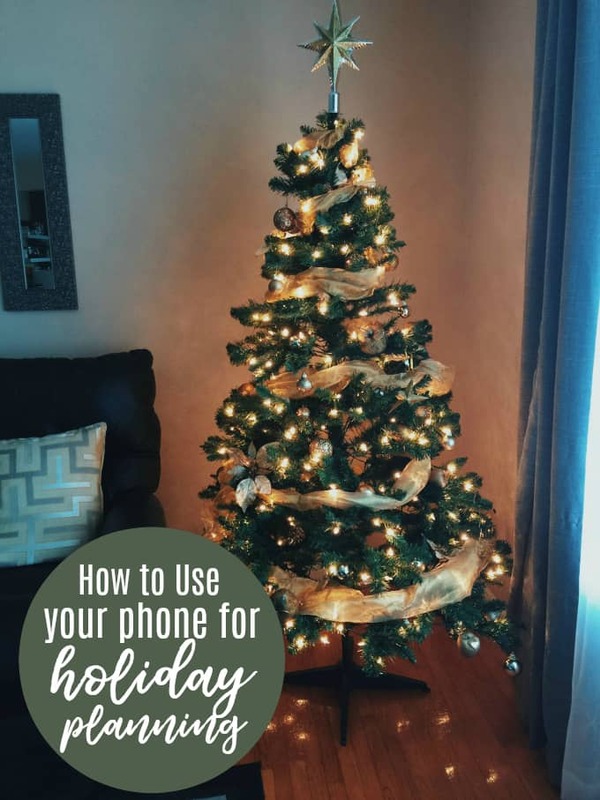 Utilizing your phone for Holiday planning is really a great idea, I mean we all have it around quite frequently and things need to be scheduled to avoid catastrophe. Totally love the list tip. Seriously lists are so incredibly important and the fact that you can make a list on your phone makes it all that much easier.